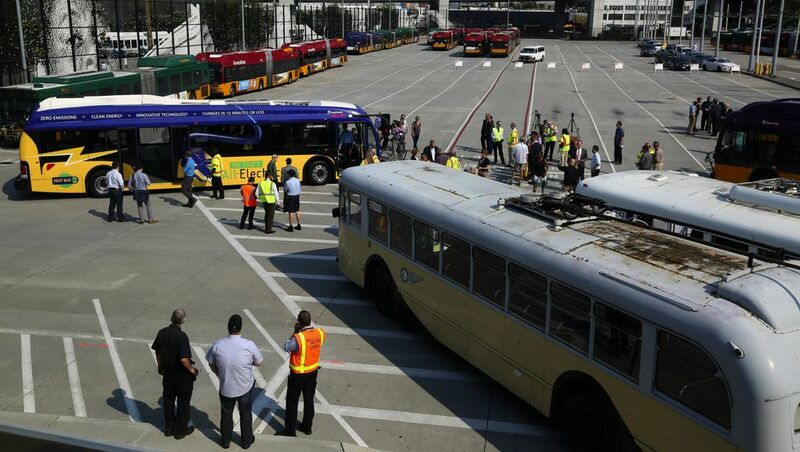 Five new trolley buses will hit Seattle streets Wednesday, as King County Metro Transit begins its two-year, 174 vehicle-replacement plan. For three decades, mechanics at King County Metro Transit kept their aging fleet of 1980s-vintage trackless trolleys alive by mixing, rebuilding and cannibalizing parts. Finally, a new generation of vehicles have arrived to sustain the agency’s popular network of wire-powered buses for another 20 years. The first five new trolley buses will hit the streets of Seattle on Wednesday, starting with routes 1, 2, 3, 36, and 70. Over two years, Metro will deploy 174 new vehicles in the city, all of them purple. The federal government is covering $138 million of the $186 million price. Metro is one of six North American agencies that operate trolley buses, which carry 74,000 of its 421,000 weekday passengers. They accelerate instantly up Seattle hills, without spreading noise and fumes to compact neighborhoods such as First Hill. “The old ones have more get-up, more power,” said Ruby Carlisle, a Metro trolley bus driver. “These are lighter. They drive really smooth.” Carlisle said the new power poles are easy to adjust using handheld ropes — which should reduce the delays and strain on operators whenever poles detach from their overhead wires. The trolley buses, by New Flyer, offer low-floor entrances. They can travel briefly offline under battery power, to bypass crashes and construction zones. 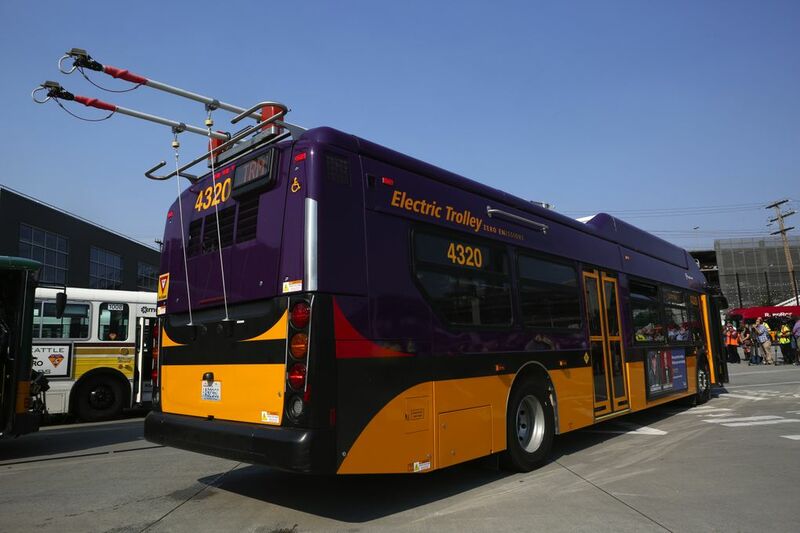 Meanwhile, Metro is testing rechargeable battery-electric buses on Eastside and cross-lake routes. Batteries are mounted under the floor, like a Tesla electric car. They recharge in four minutes, using a docking device that automatically descends to a roof-mounted port at the Eastgate Transit Center. The estimated range is 23 miles per charge. If tryouts succeed, Metro has an option to buy 200 vehicles from California-based Proterra, to replace diesel-fueled buses. Proterra CEO Ryan Popple listed at least 13 transit agencies that operate or have ordered rechargeable buses from the company. 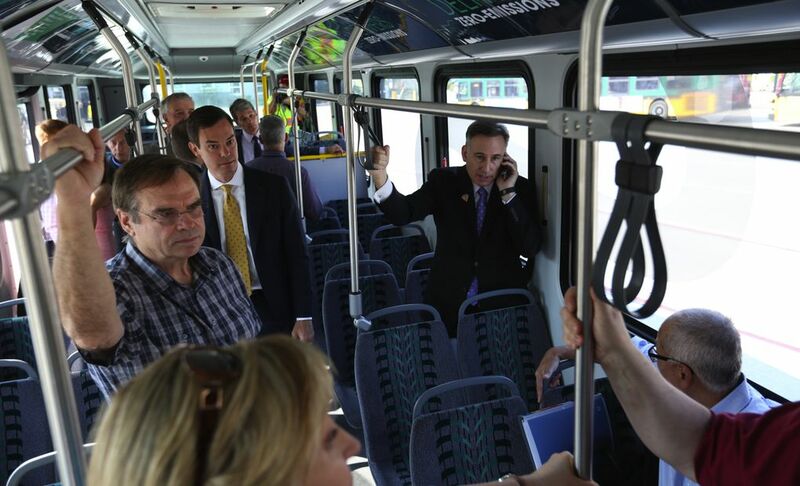 “Five years away, it’s going to be obvious you no longer need to rely on oil and natural gas to run buses,” he said. He predicted public transit will be the first category of U.S. vehicles to evolve completely away from fossil fuels.